Cornell Club of Boston 55+ dim sum lunch - April 6, Woburn, Mass. "Embers of War: Vietnam Reconsidered," with Professor Fredrik Logevall - April 10, Santa Barbara, Calif.
CSV13: A New Wave of Innovation - April 30, Mountain View, Calif. 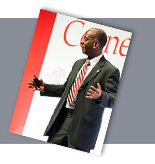 Newly redesigned CornellCast offers interactive live events, a "save your spot" feature -- great for watching lectures -- and more ways to browse. 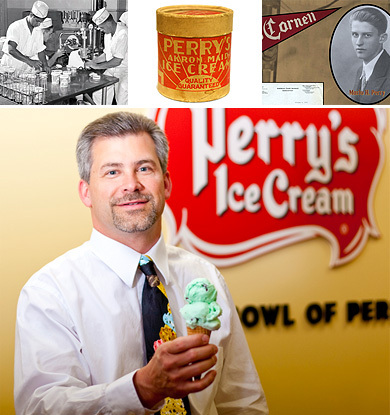 The connection between Cornell and the Akron, N.Y.-based ice cream company Perry's goes back generations, to when Marlo Perry '35 took knowledge acquired in his dairy science classes back to the family dairy to help his father expand their ice cream business. Most recently, Perry's was the immediate choice when the university needed an ice cream supplier as the Cornell Dairy Plant began a long reonvation project that is now nearly complete. University accepted 6,062 applicants for admission to the Class of 2017 this fall. The senior won his fourth national title in four weight classes; team took fifth in standings. The $85 billion in automatic federal spending cuts may eventually carry a universitywide cost. Abena Ojetayo '07, M.Eng. '09, has been named to a promising-engineers-under-30 list . The mayor of Newark, N.J., will address the Class of 2013 at Senior Convocation, May 25. Coverage of the March 15 event includes slideshow, videos of the parade. The Nobel Prize-winning author returned to campus for a conversation about language. The Academy Award nominee spoke about his time as a student and hosted a screening. Also, the Dyson School was ranked No. 3 by Bloomberg Businessweek. More than 400 Cornellians who graduated in the past 10 years gathered in NYC March 2.